We’d like to introduce you to our friends at Carolina Arms Group, longtime LSF supporters who have created yet another beautiful firearm to benefit our life-changing therapeutic program. We want to give a special thank you to their team: veterans who volunteer their time off to handcraft these 1911’s so that a larger portion of the proceeds goes to our program. Tell us about the special edition Lone Survivor Foundation Veteran 45 and how it will benefit Lone Survivor Foundation. 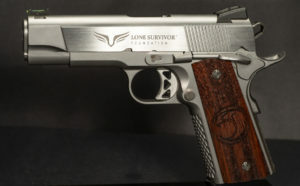 How it will this 1911 package benefit Lone Survivor Foundation? We designed the Lone Survivor Foundation Veteran 45 to pay respect to all Veterans. We are donating a large portion of the proceeds to the Organization. We believe in what Lone Survivor Foundation represents and the people that receive desperately needed assistance. Carolina Arms Group makes a point of hiring veterans. Tell us about your team and the time that they have volunteered to make the special edition Lone Survivor Foundation Veteran 45. Our Company CEO, Mark McCoy, mandated the Veteran Hire First program. As a Veteran himself, he looks for Veterans that not only want training but want to keep the comradery they had in the military. Each of the Lone Survivor Foundation Veteran 45’s is handcrafted by military veterans. Our staff represents 4 out of the 5 branches: Army, Navy, Air Force and Marine Corps. 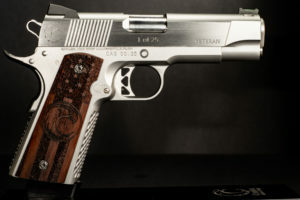 The team agreed to build these 1911’s on their off time so that we could offer more proceeds to Foundation. Each firearm takes 47 Hours to handcraft, for a total of 1,175 hours for all 25. 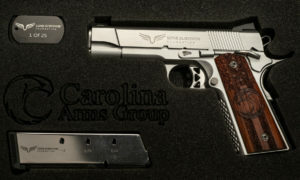 Carolina Arms Group has supported LSF for quite a while and we appreciate it so much! What is your connection to LSF and why have you chosen to support us? We have supported the Foundation because a close personal friend that was treated by the foundation. Mark McCoy, our CEO, met with the volunteers and instantaneously became overcome by the kindness and respect offered to the Veterans. It has been his charity of choice because we know that the funds go directly to support the foundation. It is a true honor to be able to help out the Lone Survivor Foundation!